January passed almost silently, and then there came a big shock. I’ve had my head down dealing with it all, and then before I even noticed, the middle of February came and went as well. At the start of January I set out to get my year’s training off to a good start by heading up a reasonable sized hill every weekend. I finished with a hill in hand, although I’d repeated one too so really I’d call that all even. 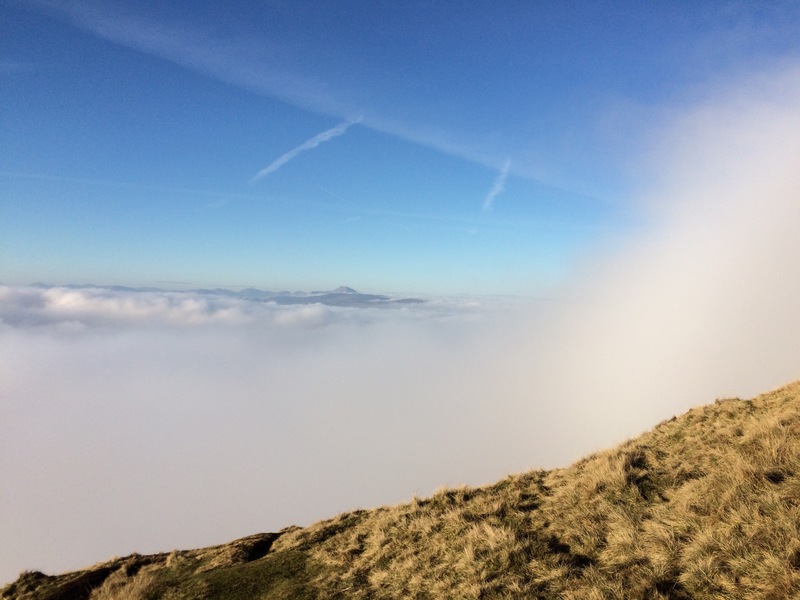 The day before my beautiful greyhound Ronnie had his accident, I’d been up Dumgoyne – one of my local hills. It’s the very distinctive lump at the western end of the Campsie Fells just north of Glasgow. There are a few routes up and round it, with a notoriously steep track that goes straight up the middle. I’d chosen one of my favourite running routes that day, taking the pipe track from Blanefield out to Killearn and then coming back along the West Highland Way. 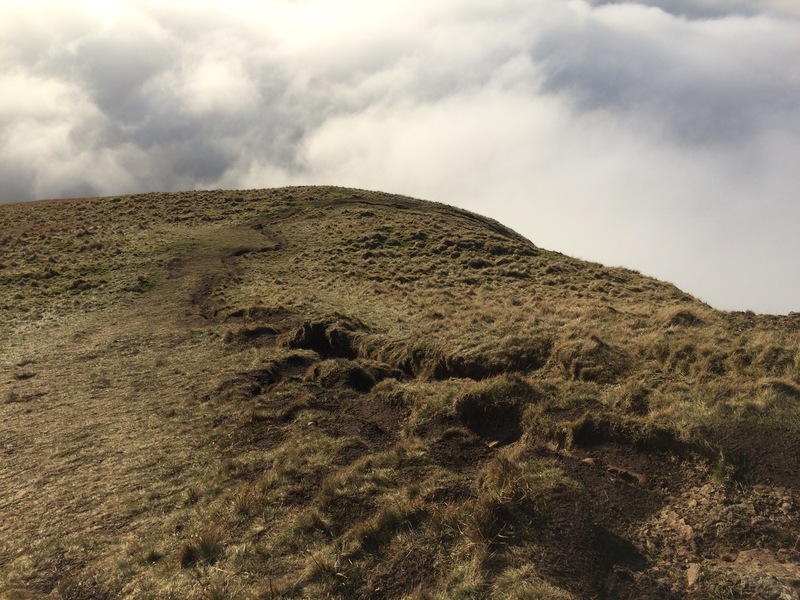 I added a steep stomp up Dumgoyne to collect the required weekend hill. The mist was dense around the pipe track, but it was clearing higher up above me and in places there was a bit of blue sky peeking through. 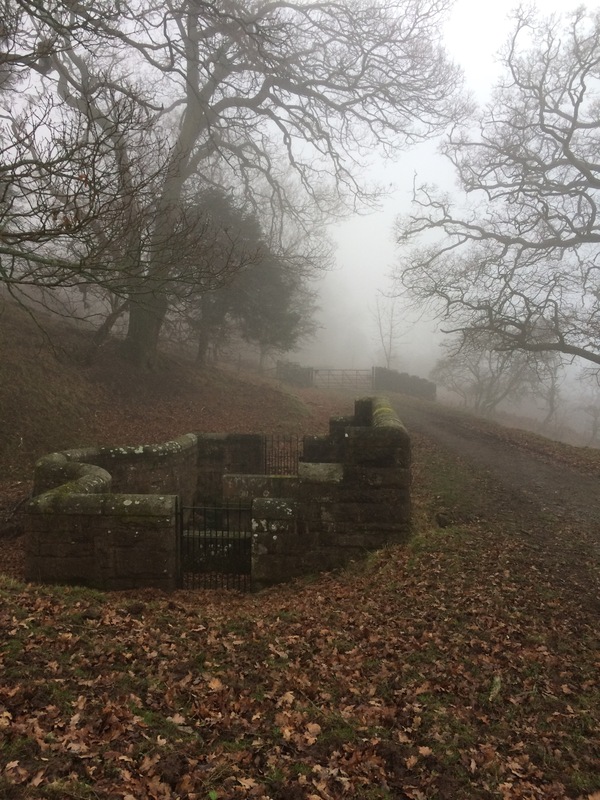 The strange Victorian waterworks emerged from the fog as I ran past them and it was eerily silent. I set off up Dumgoyne, taking the slightly less steep side path. The ground was frozen solid in places but with patches of very sticky, slidy mud. I almost came back down without going all the way up. My normal shoes were wrecked so I’d worn another pair that were good on grass and trails, but hopeless on mud. I lost a lot of confidence in my feet after the fall in Austria a couple of years back, and although better now, I’m still building it back up. The reason I carried on, apart from the obvious draw of the summit, was that I suspected it would be clear on the top. I could see more of the sun as I went higher although the mist was still thick in places. Finally I was past the steepest part of the climb up and I began to make my way along the narrow path across the face and then up to the top. As I plodded, something caught my attention to my left. 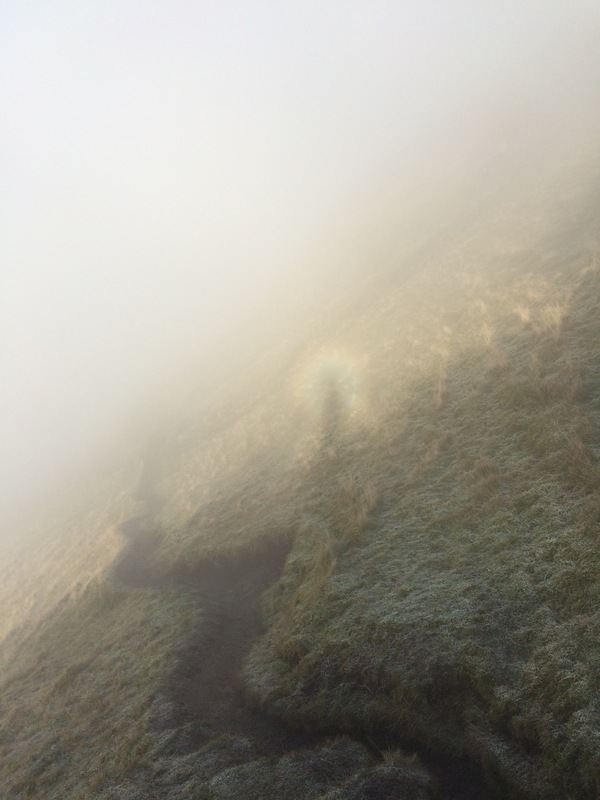 I was astonished to see my first Brocken spectre – a slightly creepy trick of the light that happens on foggy days when the sun can cut through the mist. There I was, or rather my shadow was, bathed in white light and a rainbow halo. I shivered a little bit, and choked down a couple of tears. Just in that brief moment, despite the thrill of what I was seeing, I felt desperately sad to be out on my own with no one to share the moment with. It passed, and I headed onwards to the summit. Soon the mist was level with my knees, then far below me. 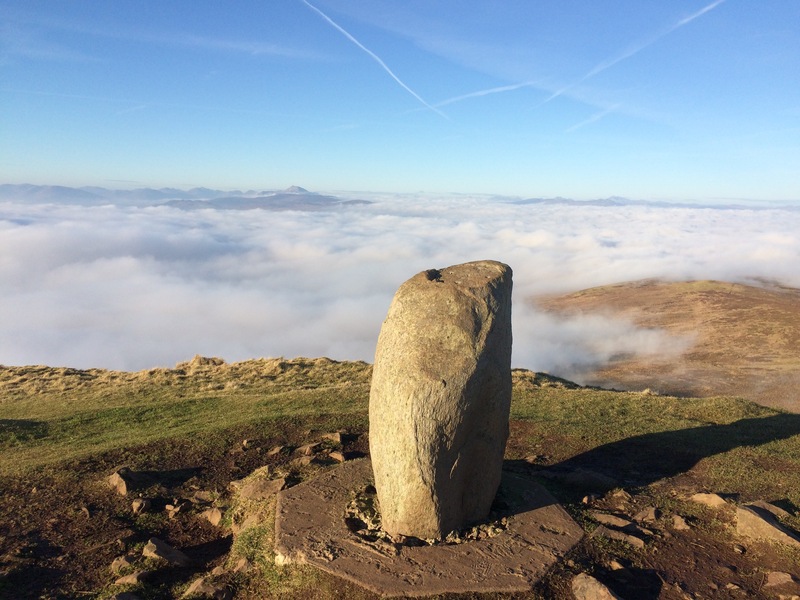 As well as the Brocken spectre, I had finally bagged my first cloud inversion too. The sun was bright, I was high above the clouds now and I could see over to various other mountain summits poking out. There were a few other people at the top enjoying the experience, and we shared laughter and our wonder at the whole thing. After a while I headed back down, slightly fearfully and therefore extremely carefully. I made it safely back to the path dodging small boys who were enjoying hurling themselves down the muddy slopes, and I continued with my run. The next day, I had gone to visit my parents in Dunoon with my dogs. Ronnie broke his leg chasing after young whippets in my parents’ back garden. Sadly it was a nasty injury and with the support of my wonderful vets, I made the decision to let him go. He was very old, and he had lived out a long and very happy retirement with me. He was a dog who was impossible to love too much, and everything I gave him, he gave me back a million times over. He left the world in one of his favourite places (he absolutely adored going to the vets) and he got to say goodbye to all the people he knew and loved the best. When I look back now to that awful day of the accident, I think of the day before, and I imagine that maybe wherever he has gone now, he has found some company and it’s like the top of Dumgoyne that time I was up high above the clouds. Peaceful, filled with sunshine and warmth and laughter. Among good spirits, and not so far away from home.